On Thursday 5th and Friday 6th May the Year 2 children enjoyed a wonderful trip to the Botanical Gardens in Birmingham. This was to support them in their learning journey about 'Rainforests'. The weather was great and the children learned a lots, which they have talked about almost non stop since returning to school! 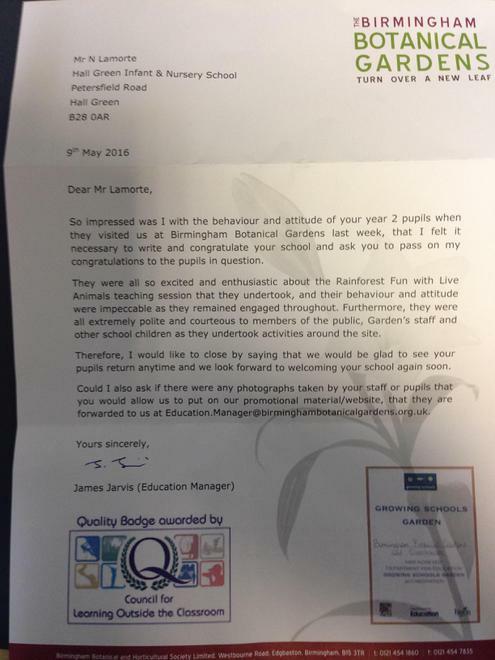 I received a letter from James Jarvis, the Education Manager at the Botanical Gardens who commented on how impressed he was with the impeccable behaviour and attitude of the children. He also made specific reference about their enthusiasm and politeness. You can read the full letter at the bottom of this page. daughter yesterday as she was off for polling day. on the play area in the afternoons. Obviously we are very proud of the children for representing our school so positively and to the staff, and volunteer helpers who supported them so effectively. Sometimes an exciting trip can be all too much but the children have demonstrated how mature and 'responsible and trustworthy' they are. Congratulations to them all!! I have sent both the letter and e-mail I received to the Chair and Vice Chair of the Governing Body, who have passed on their congratulations to the staff and children at school. Follow the link to the class pages below to see pictures from the Botanical Gardens trip.